An industrialized island where Draphs make their living. Seething flames surge beneath the rust-colored earth. 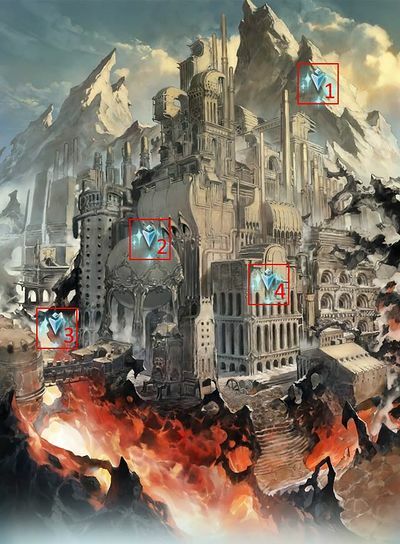 Valtz Duchy is the location for chapters 5-8 and 122 of the main quest. A Draph country where scorching heat slumbers beneath the land. Due to the intense temperatures below ground, a river of lava flows there without ever hardening. Prosperity is wide-spread thanks to a steel industry that takes advantage of the heat of the land and Draph handiness. The grandest factory in all of Phatagrande Skydom is located here, laboring day and night. Metal vessels forged in Valtz are famed for being robust, beautiful, and of the best quality. They fetch a high price throughout the Skydom. The largest factory in Phantagrande Skydom and the official residence of Valtz. An arsenal from the time of the War was repurposed to become the Archduke's citadel as well as the seat of the government. It is indicative of the type of Valtz tenacity that arose along with their growth through steel industry. There are countless factories on Fremel Island; some of them abandoned for centuries. They have no names, only numbers. Altogether these factories are called the Plant. Collectively, the mines that surround the factories are called the Arsenal. Like the factories of the Plant, these mines have no names, only numbers. Most of Valtz's mountains are mines, but a few of them are lush and green. Draphs can be found on those verdant peaks, living in harmony with nature. The heat source that supports Valtz's industry. It flows throughout the entire country. Since time immemorial fierce heat has smoldered deep below the island, so this river flows without ever hardening. Barren earth that covers the island. The cruel environment does not yield even the smallest of mercies..
An early mine. Presently it's being used for suspicious purposes. First clear: Crystal ×50Verification needed. , Io joins your party. Location: Chapter 6: Valtz Duchy - Arsenal, Abandoned Mine Start QuestNetwork Errors will appear if the hosting conditions are not met. An everlasting lake of lava. Below it slumbers a scorching heat that melts solid stone. Cost to Host: 50 AP Unlock: Rank 50+, Obtain Durandal and increase its level to 100. Cost to Host: 50 AP Unlock: Rank 50+, Obtain Exitosus and increase its level to 100. A workshop that has endured since ancient times. It bears the name of the founder of Valtz. Location: Chapter 8: Valtz Duchy - Kushathra Works, Underground Factory Start QuestNetwork Errors will appear if the hosting conditions are not met. You cannot host both Colossus Hard and Colossus Hard+ in the same day. Massive~77000 with no debuffs on Water Fire damage to all allies. Removes all debuffs on self. 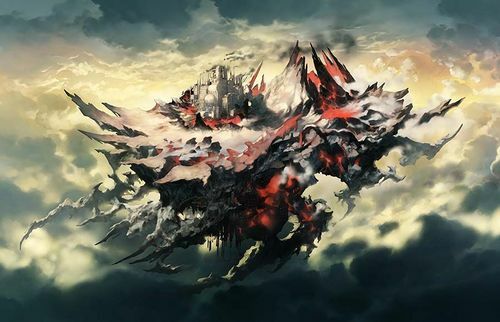 Only Colossus Omega must be killed to complete the raid. Immune to Lethal HitInstant death for the victim. Gain immunity to PetrifiedStops enemy's charge diamonds from filling. Vulnerable to Lethal HitInstant death for the victim. Massive Fire damage to an ally. First clear: Lvl Cap +1 for Colossus Blade Omega, Colossus Cane Omega, Colossus Carbine Omega and Colossus Fist Omega. Dimensional Cleave has gone from "Massive Overkill" to simply "One Hit Kill without mitigation". Going for the Arm first helps to prevent this in two ways: As you're killing the Arm to stop the Cleaves altogether, activating its Heat triggers clears diamonds. You get two clears this way and should be able to get a Break before it can refill after the second Heat. As with the other Impossible Omega raids, the fight calms down a bunch once the add is dead, especially since Break Lock is so readily available from Water players. Just don't carelessly auto into Resolute Reactor at the end. Note: A curious wiki user here. There was previously a charge attack (that was unverified) on this page named White Tempest that apparently triggered either as a normal charge attack or in Overdrive from 100%-75%. I looked into it with my crew and after extensive testing, White Tempest did not trigger once under any condition. We tried tanking as many charge attacks as possible (especially in OD between 100-75), spent a few hours repeatedly hosting this raid, testing if different abilities triggered it, and none did. The charge attack wasn't seen once by any of us. If someone sees this, has seen White Tempest, and knows what it does, please add it back to the page, because I've deleted it from the list of charge attacks for now. I don't know how to contact a wiki mod about this either, so I'm just going to put this info here. This page should still be in the Verification Needed Category, though. A final note: Listed in the Leviathan Impossible raid, in the Charge Attack list, is an attack named Sterling Storm. This is reminiscent of White Tempest, and seeing as it makes sense that Colossus does not have a charge attack named such but Leviathan does, the original White Tempest on this page may have been a translation error that ended up on the wrong page. Attacks and skills instead heal Fire targets. Fire damage received is reduced to 0.
, raising ATK and lowering DEF based on the number of debuffs. DA rate increases during this phase. Duration: 2 turns on one ally. Increased damage after True Power unleashed.